It seems Rockstar can't get enough of torturing us with GTA V teasers, and it's just leaked out another three screenshots for us to feast our eyes on. The new screenshots seem to be part of a week of teasers, with Rockstar giving us a previous trio of snaps on Monday. 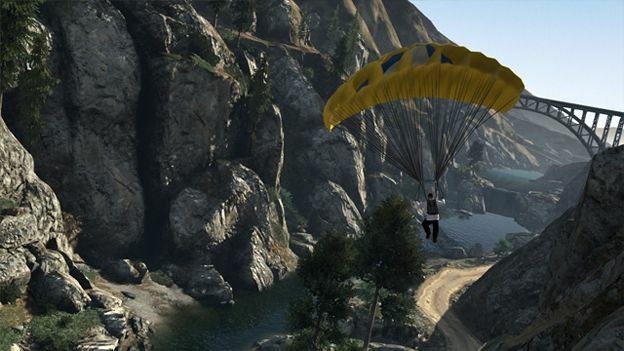 The latest shots show someone paragliding, a couple of people dirtbiking, and even some characters playing tennis. The blog post on Rockstar's site was titled “Leisure” so we hope these will playable mini games, perfect for unwinding after a hard day of mowing down drug lords. We've also noticed the three blank boxes that remain on Rockstar's website, suggesting we might get a final set of pictures by the end of this week. Given the timing of the new teasers, a 2012 seems extremely unlikely, though we're still banking on it appearing before April 2013. At least, Take Two will be banking on it if it wants to reach its previously-outed financial forecast.